I have cut up questions I have asked pro triathletes from an old media website I use to have. Each week I will post a new question. Chocolate, Coffee beans, Milk, Yoghurt and Cheese. Hahaha… well seeing as I am in between training locations right now, and staying with family, I don’t really have a fridge I can call my own. But I do my best to try and eat halfway intelligently. I like a few certain veggies (sweet potatoes, squash, mushrooms, peppers, spinach) and always try to keep some good fruit around (bananas, apples, berries). Unfortunately I have a serious problem with cereal and thus I try not to buy it and stick to oatmeal. I also try to eat a fair amount of brown rice and quinoa. COFFEE is a big part of my life and most days don’t start without it. I try to keep red meat to a minimum but grew up as quite a carnivore, so that is tough, so I typically eat it once or twice a week and get most of my protein from eggs, salmon and chicken. Probably nothing as I tend to eat all the best stuff as soon as it is bought!! Haha! There will always be some organic milk in there though for my protein smoothies. Food and lots of it. Very little, I live across the road from Whole Foods in Boulder Colorado. Lots of fruit and veg from my garden and homemade pasta sauce which my wife makes! Meat, Veges, Fruit, Eggs, Yoghurt, Orchard Gold Frozen Berries, Red Wine, Dark Chocolate. Lots of Yoghurt and Milk, i could live off Muller fruit corners! Bulk leftovers. My Mums is a compulsive cook & my Dad is a chef. Nothing is ever in short supply and there’s always a myriad of things to snack or feast on. I also eat a lot of fruit, so expect some fructose goodness. Pasta from last night, yogurt, chocolate if it’s hot and melting on the bench, Milk (low fat cause I watch my figure.. lol), beet-root, cheese, a meat of some sort for tonight’s dinner…and then there’s all Kate’s vege’s and fruit and stuff.. Oh and you’ll find sauces… I love sauces…we have like 10 half empty containers…(my bad). Eggs, lots of eggs. Smoked Salmon. Cheese. Yoghurt. Coke. San Pelligrino mineral water. Milk. Chocolate milk. Butter. Cream. Blueberries. Nothing out of the usual, I need to work on my nutrition. Milk is definitely always in there for making my protein shakes after training. SALAD, WHOLMEAL BREAD, SKIM MILK, MEAT, TUNA, SALMON, VEGGIES, APPLES AND BANANAS, JAM AND MOST IMPORTANTLY NUTELLA! A lot of food! We eat a ton of fresh food, and will often stop by Whole Foods to purchase prepared food items – this is essential in big training blocks, when we may not have the energy to cook a proper meal. We do love to cook, but sometimes we just can’t muster the strength. Currently the fridge has the following: kale “superfood” salad with acai dressing, carne asada, mashed sweet potatoes, turkey meat, Udi’s bagels, coconut milk, yogurt, lots of berries,eggs, hummus, carrots, fresh lettuce/ kale/ romaine. Really, the list goes on and on and on. Groceries are our biggest expense! What are your favourite training sessions for each discipline? My favourite swim sessions is our weekly Wednesday mornings at Noosa main beach doing Ins & outs with the surf club guys. The Tuesday morning bunch ride is a really good hit out with a strong group of cyclists and my Sunday long runs in the Noosa National park can’t be beat! Swim: A great set for when I’m solo is a change of pace set. A constant 1500m made up of: 50 easy/50 moderate/50 hard x 10.I’m actually wishing I had done more of that session recently. I’ve been so caught up in getting in and swimming at the 1 speed! Bike/Run: 90mins-2 hours on wt with some nice long efforts. (10 mins/9 mins/8 mins/7 mins/6 mins/5 mins etc.) Followed by a build run (10k). In swimming it is short 100m sprints as long as it is in a group. Biking it is a 4h ride with two 12km passes in the middle of the ride. Running its again a group workout on the track. 10*800m! I love it! Swim – wednesday night speed/lactate session. This is my shortest swim session for the week but by far the hardest. I really feel like I’ve done something after this session. Bike – I have two favourites. Wednesday morning hilly ride. At the time I hate it but I love the feeling after I’ve completed it. I also time myself going up the mountain so I like the challenge of racing the clock. And Saturday club ride. This is my long ride. I leave my house before 4am and ride 30km to meet my cycling club. Then I’m in for a 100km smash fest where all the boys are constantly trying to punish each other. Then I’ll ride home. Run – Tuesday night I do my faster than race pace session with Jared. It hurts!!! The refueling after :-)!! In all honesty I have a real love/hate relationship with most of the really challenging sessions. That is, while I may dread the hour and forty minute run with a big chunk of tempo in it, I usually take the most satisfaction from that session. Likewise, a tough swim session with say 5×400 at a high effort may give me pause while on the deck, but walking out to the car after, I feel the most satisfaction from the good hard effort. The same goes for cycling, and it is usually the mid range (3-4hr) rides with some good hard efforts in them that I enjoy the most. Swim Set of 15 200’s. Increasing in pace. So for example 5 on 3 min, 4 on 2.55, 3 on 2.50, 2 on 2.45, 1 flat out. Change to suit your own pace. Bike Hill reps. 6 by approx 10 mins. 1 steady (stay seated to work quad strength), 1 med, 2 hard, 1 med, 1 steady (staying seated). Run Some kind of fartlek session with sprints and hard intervals of various lengths. I much prefer to do this on the beach rather than on the track. Long runs and rides in the hills and open water swims. Swim- surfing with the boys. Bike- anything on the bike but a road race or crit is always fun. Run – I really enjoy hitting the treadmill for a solid hour of power. I just set the treadmill at 18kmh and crank the tunes and get in the zone, I don’t have to think too much or stop for traffic lights so its easy on the mind. Bike – I have been working with a couple of new sponsors of late Wattbike and ATS altitude technology systems, I have been using the altitude simulation at about 3400m and do a 3hr Wattbike session with 4x20min strength efforts trying to hold about 260 watts….and at about 12 percent oxygen its not fun! Swim – I tend to swim how I feel depending how hard my bike and run sessions are, I don’t see the point of flogging myself in the pool when I am tired as it only creates bad stroke mechanics. I really enjoy swimming open water at West Lakes where I swim with a friend of mine who paces me through the session, nothing beats race simulation training. Swim – Ocean swim in the summer. Long relaxed aerobic swim. Bike – 200km loop around the Coromandel. Awesome views with 2000m of climbing. Good Honest ride. Run – Threshold intervals. Nice even burn between the legs and lungs! On the cycle, I like nothing better than a solo long ride. 5 hours minimum, just me, the countryside, mountains and good music. A bakery stop is mandatory. On the run, I’ve got some mountains that I like to run up at a threshold pace for strength. It’s always a nice view from the top, but a brutal session with at least 30mins of tempo up a 5-10% gradient. Swim: I love paddles, pool buoy, and band. I do a lot of my swimming like this to build strength in my shoulders. Bike: FTP sets, they might only be short and hard but when working at 120% of FTP you know you have worked hard. Run: My long run, I have been running off feel in the last few weeks. No watch and not stressing about minute mile ect. What I have found that I am running faster. I normally download IMTalk and listen to that, and just switch off. Off road running doesn’t do it for me, also I think you should train as you would race. 3h on the tribike including 3x 10′ overgeared and after 30′-45′ easy riding 3x 5′ all out. 15-25x 1km 1 @ IM pace 1 @ IM 70.3 pace with my wife on the bike as company.. If we were to look in your fridge, what would we find? A lot of fresh vegetables ! I like doing 10 x 400m in the pool because its like an Ironman Swim.. especially if I do some with the Pull Buoy and Paddles on my hands. On the bike, I like doing strength hill repeats. My favorite run session is either my long run, anything up to 35km, or getting on the track and doing some speed such as 8 x 1km repeats descending a couple of seconds each rep.
My favourite set for each leg is when I get to train with other people. Swim would have to be 5x400m for main set, the ride I just hammer myself all the time so it does not change and for the run I like doing 6x1km with minimal rest. Swimming: I love a nice 5k swim, with a group or with two key swim partners. My idea of fun in the pool involves a challenging main set of around 3k, where the rest is short and I attempt to negative split – one of my weakness in the water! I like basic, such as 10×300. With cycling I love to ride up one of Boulder’s long canyons, doing a combination of big gear (low cadence) intervals, followed by some time trials on the flats. My little group of training partners and I will often do pursuit-style starts, so we can chase (and run from) one another. I love running a longer session of 15 or so miles, with 4×2 miles at or below my half marathon pace. These force proper pacing, and they give me great confidence for upcoming races. My training doesn’t necessarily follow the same pattern week in week out but I generally train between 25-35 hours a week which includes swim, bike, run and gym work. My week is a combination of social sessions and key sessions. I am very aware of perceived effort- My easy is very easy, while my hard sessions I like to really push. I mix it up so it’s not the same every week. I aim to have a solid swim and a social swim. I do a long ride, a social ride with friends, and a solid ride either road or WT and a brick session. I really believe in wind trainer sessions to work on my threshold level for 70.3’s and Ironmans. I also do a long run, threshold runs or track, and the social runs where I’m chatting with friends. I do 6-7 swim session a week covering about 20-25km. 4-5 of these are with a swim squad under coaches Brendan Capell & Zane King. I’m on the bike 6 times a week. This includes one long ride, one hilly ride and one tempo/TT session. About 500-600km is my weekly mileage. I run 6 days a week, including a faster than race pace session, a threshold session and a long run. Plus some easier runs and brick sessions. I will run about 70km/week. Jared (my partner) and I work out my training program with regards to the bike and run. Some swimming, running and cycling. 😉 Hahaha… I would say that my training weeks are fairly common, no real secrets or crazy workouts. Consistency is the main theme. So on average my weeks usually contain 5-6 swims, 5-7 run sessions, and 4 to 5 cycling sessions. 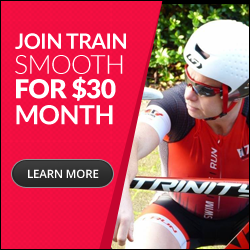 I am a member of the Triathlon Squad under Paulo Sousa (https://www.facebook.com/pages/The-Triathlon-Squad/183206021698840) and we have month long training camps in different locales around the US throughout the year. During those camps training picks up a little, but not so much different than the rest of the year. My training has changed dramatically since the birth of my baby Benji in July 2011. Before that I was doing around 30-35 hr per week. Now I am doing around 20 hr per week with some big weeks of 24 hrs. I am more focused in training and every time I go out I have a specific goal of what I am trying to achieve. I coach myself and am flexible and work around my little boys needs. If I don’t get a lot of sleep some weeks I change what I am doing. I don’t get nearly the amount of sleep I used to get and am still breast feeding so it is important for me to be flexible with my training in order to stay healthy and have the energy levels required to make the most of the training I do. It is working for me. I am feeling fitter than ever and am beating all my previous times. Leading up to ironman a good week would involve 20-25h 3-4 swims (8-12km) 4-5rides (350-500km) 5-6 runs (70-90km). Due to working full time as a fire fighter my weeks change depending on the work. Sometimes we might have a busy night at work (saving cats, babies and old ladies from burning infernos!) So my next day’s training will be modified accordingly. While I was in the US on leave my training was about 120km running, 5-600km bike and about 15-20km swimming. I try to maintain these distances weekly with a rest day mixed in. Every 4 weeks I include a lower volume week. I average about 35 hours per week of training. During the winter I try to do higher run mileage and in the summer I do a lot more bike miles. Between 30-35 hours of trainings. In terms of totals, it’s about 15-20km of swimming, 500-600km of cycling and 70-90km or running. All of this is mostly aerobic work and not too much intensity. Over the years I’ve learned to back off intensity because it kills my longevity throughout the season. I’m also doing 2 pilates sessions for core strength and to promote good biomechanics throughout all three legs. Bike, in winter I do lots of FTP work on my computrainer. Based in the UK It was a struggle to get long rides in. Now it’s summer I have a long ride on a Tuesday. I ride 2.5easy then meet up with chaingang which is another 2.5 at a real solid tempo. Saturday I ride from 4hrs up to 6.5hrs all above IM pace. Wednesday I ride 2hrs tempo with a runoff, Wednesday night I ride 2hrs real easy. Run, I run 5 times a week. One long run 2/2.5hrs with changing of pace in the middle. it can involve 10k pace, HIM pace, then back tp IM pace. I have a double run day on a Monday, 1hr easy then 1hr of threshold in the evening. In average 4 swim sessions, 5 bike rides and 6 runs + 2 times wheight training and most important core work every second day. Depending on the time of year, but at the moment 20k of swimming 450k riding and 60-70k of running. I built back into this over a 3 week period. I usually swim about 5 times a week, totalling around 20km…. then on the bike i like to do 2 longer rides over 150km and then 2 shorter harder rides that are strength focussed. On the run I usually do between 80km-100km a week…. I have one big long running day and then a couple of runs off the bike and also a tempo run. I don’t record any of my training formally or follow a training schedule. I just simply get up in the morning and decide if I am going to go for a ride, run or swim depending on how I feel. But typically I do about three swims per week, between 4-6 runs including speed sets, and about 300km on the bike. FROM 20-35HOURS DEPENDING ON WHERE IM AT. Typically I swim six days a week, aiming for 24,000 meters total. My cycling varies greatly based on weather (winter! ), but I will aim for a minimum of four days, and a maximum of six. I find that I can do a lot with five days of riding, totaling about 280-300 miles. The running will most often be 45-65 miles, depending on the time of year – and I like to run six days per week (often one day of double runs). The total hours weekly are generally from 24-30. I don’t count the gym sessions in there, but I try to do a couple 45-60minute sessions.